Like all wars, human suffering stands out as the key legacy of WW2, but the degree of human suffering experienced in WW2 was unmatched in history. During the war, carpet bombing campaigns targeted civilian targets as much as military ones, while starvation and disease claimed a stunning number of lives. Atrocities also added misery; the Holocaust alone killed 11 million people, half of which were Jews. The post-WW2 era saw the decline of colonial powers, notably the United Kingdom, which set the way for the United States to rise as the new dominant power of the west. Another political outcome of WW2 was the formation of the United Nations, which hoped to succeed where the inter-war period League of Nations failed. WW2 had only just ended when the world plunged into another conflict. In Europe, a rift grew between the uneasy alliance of capitalist and communist philosophies, splitting Europe into two, divided by the "Iron Curtain". Because the two dominant powers of the post-WW2 era, the United States and the Soviet Union, never directly fought an open war, the term "Cold War" was coined to describe the tension and rivalry between them. The two powers did, however, engage in proxy wars such as Korea and Vietnam. 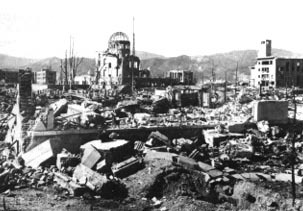 The successful detonation of the atomic bomb during Operation Trinity not only directly led to the destruction of Hiroshima and Nagasaki in Japan, but it also marked the start of the Atomic Age. Thus, in addition to the massive build up of conventional weapons, the Cold War also saw the race to stockpile atomic weapons. Some WW2 legacies still impact our lives today. For example, the Japanese government continues to face criticism for its handling of the atrocities committed by the war time regime, while Nazi hunters continue to track down war criminals who were never brought to justice. World War 2 changed the world, split into two camps in Europe, East vs the West, a Cold War that continued until the fall of the U.S.S.R. NOW ITS THE INFORMATION WAR! and its World Wide. Friend's have become enemie's, and enemies have become friend's. its pretty good info on wwii but some of it just goes on and on with the same info. we should of won that war yes we the allmighty and powerful German nation. ala Hitler! Thank You for such an interesting site. A fantastic find. It is true that the US tried and tried very hard to be the dominant power in the world but it failed and miserable so. It is worth noting That UK NEVER goes to war unless it is sure it is going to win (It has lost one war in 250 years!) and even that was a political blunder rather than a defeat Whilst the US has yet to win unaided any war of note. Principal because it has it's eye on the dollar rather than the aim. It was all but destroyed in Vietnam because it failed to understand the people it was fighting and it's disgraceful lack of creditable intelligence. No excuses they were told by both the British and the French they could not win but in their usual bombastic way they ignored the voice of vast experience. I suspect that within the next 50 or so years the US will just be an unpleasant memory a hiccup in the course of world politics. Why because they do not sing from the same sheet and their commanders are in the main rubbish. I Really Liked This, It Helped Me On My Hw! This is a totally irrelevant comment just coming here to try and stay relevant. I represent the USA during the war. How irrelevant I am right? Also, on a totally unrelated note, how is everyone? No one even posts on here. 2018 comment!! Woohoo!